I also hate Evolution, and have a dislike for Sunbird after using both for several years. Currently my desktop calendar system is mainly Google calendar, my phone and for quick looks while offline, orage. Orage doesn’t currently come with an option of subscribing to online calendars, but that can be easily solved. What I don’t like is synchronizing these by hand. Things should be automatic, easy and happen without me noticing a thing. Here in picture comes my home server, bluetooth dongle, crontab, msynctool and wget. Most important part of this setup is msynctool. 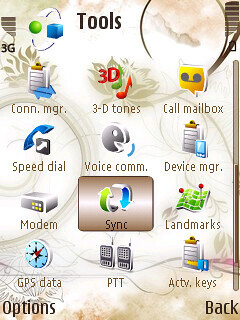 I use it to synchronize my phone with Google cal automatically with cronjobs. In Intrepid the needed tools are available from the normal intrepid repositories. In this case the channel is 10.
in this case, let’s do two groups, google-phone and file-backup. Replace the USER and PASSWORD with your own. Save this file to your home directory or somewhere else accessible, because we’ll need this for configuring the file-backup group! 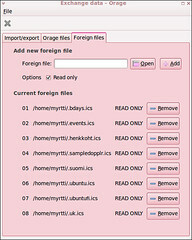 and add it them to your cronjobs as in the example in the beginning of this entry. This entry was posted in ICT, Planet Ubuntu, Tips'n'Tricks and tagged calendar, howto, Nokia, reference, s60v3, schedule, Symbian, SyncML. Bookmark the permalink. Wow, great post! I own a Nokia N95, which is based on S60v3 (and i use ubuntu ;D). I personnaly “only” use gcalsync to sync my phone to google calendar. This is a great write-up but there seems to be one bit of information missing. On the phone under the sync profile/Applications/Calendar, what is the remote database called? 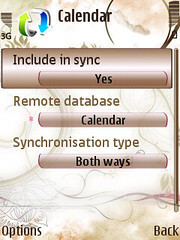 The phone (N95 8GB) won’t let me complete the sync profile without this info. Finally, there might be a mistake in the syntax of the syncml-obex-client command in step 3.On my machine (intrepid) it just returns a usage message. Needs channel number after the address. Ah, *that* was the screenshot I forgot to take! Good that you noticed it! Doh, I can’t read or copy and paste! But I have a problem with Google Calendar. When I use the “default” calendar, I have got any problem. But if I want to use a subscription (I have a Birthday calendar with some friends) I couldn’t. I only can use http://www.google.com/calendar/feeds/USER@gmail.com/private/full in the google-plugin; and the private url for a subscription is like http://www.google.com/calendar/feeds/k3tbr4uo0jn……..g%40group.calendar.google.com/private-1eee0a8f……….b2/basic and it doesn’t work with that. Anybody know how to sync my Google Calendar to my symbian nokia phone? This appears to be what I have been looking-for for a long time. Syncing S60 phone (N82) to Mozilla Sunbird/Lightning. Anyway, it is supposed to sync also email and tasks, but only when I disabled them I got my calendar to sync. But now it does it beautifully directly with the google server. P.S. It says I can use openid to not have my comments moderated, but it does not say how to do that. I mean, my website url is my openID, but it did not try to authenticate with that? About the google approach of connecting to an exchange server: Well, it did copy the phone events to gcal once successfully, but after that it mostly says “system error” in the middle of syncing and new events created at either end just don’t appear. I like your graphic design btw, is it yours? None of the links in the footer seem to take to any wp theming page. Anyone here was able to sync from ubuntu with OVI.com? I mean via Opensync or any other way? I am trying to it with SyncEvolution and I have volunteered to help/test guys on that project, basically its part of Intel Moblin. I have also joined ubuntu-nokia-users group on launchpad but I didnt see much happening there.